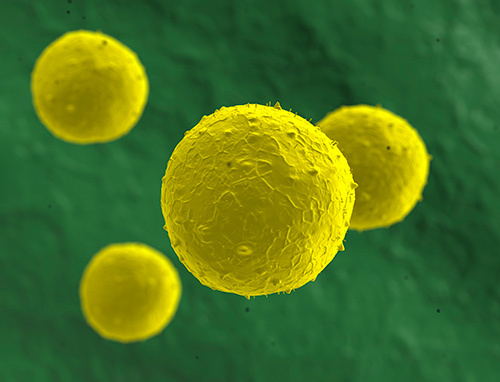 For over two decades, stem cells isolated from umbilical cord blood have been successfully used in transplant medicine to treat life-threatening diseases such as leukemia and other cancers, and blood and immune disorders. Umbilical cord blood stem cells have been used in more than 35,000 transplants worldwide. With regenerative medicine continuing to attract interest from scientists and clinicians, umbilical cord blood stem cells are increasingly being investigated for their capacity to induce healing and help repair tissues in conditions that have no cure today. Cord blood collection poses no medical risk to the mother or infant. When cord blood is donated to a public bank, it is HLA typed and catalogued in a searchable registry, allowing physicians to match a unit to an unrelated patient requiring a stem cell transplant. Compared to bone marrow, cord blood offers the benefits of using biologically younger stem cells and less risk of serious complications when used in transplants. Cord blood also circumvents the technical and ethical concerns that can arise with research involving embryonic stem cells. Clinical trials are already underway to explore the use of cord blood cells to treat a number of disease states, and the field is poised to deliver some very exciting breakthroughs. However, while clinical trials are essential for validating a therapeutic option and bringing it into practice, they can be both costly and time-consuming, and researchers, therefore, look for ways to optimize trial strategy. Family health registries may provide a possible solution. Because of their ongoing relationship with the family, private banks have the opportunity to record extensive family health histories, which may help scientists retroactively link preliminary clinical trial outcomes to genotypic and phenotypic traits. This is a huge potential benefit both in evaluating results and in recruitment for a clinical trial, where enrollment can be targeted to those people most likely to benefit from a given treatment. For example, Cord Blood Registry® (CBR®), a private cord blood bank, recently established its own voluntary Family Health Registry™. As discussed at a roundtable, 1 organized by CBR in advance of the 13th Annual International Cord Blood Symposium, one aspect of this program is collecting health and treatment information on registry participants, focusing on the cord blood donor but including information on other family members as well. By collecting family health data, CBR identified the most common transplant indications in its client population. They found that approximately 1 in 7 of the registered families responding have a family member with one of the transplant or experimental regenerative medicine applications listed. The most common stem cell transplant indications reported were lymphoma, leukemia, sarcoma, and sickle cell disease. Other indications common among registered families, such as certain neurologic injuries and congenital heart disease, are being investigated for regenerative medicine applications of cord blood in ongoing FDA-regulated clinical trials. With the health and treatment data provided by families, CBR is able to inform decisions about what newborn stem cell clinical trials are likely to have the greatest impact, and help sponsor investigator-initiated trials. Expecting families might be surprised to know that worldwide, 33 clinical trials are investigating cord blood as a therapeutic intervention in regenerative medicine applications, 13 of which are taking place in the United States. 2 The primary focus of many of the U.S. based trials is demonstrating the safety and feasibility of autologous cord blood, although more recently initiated trials are investigating efficacy. By utilizing autologous rather than allogeneic cord blood, investigators mitigate the risk of immune-mediated adverse responses in these early-stage trials. 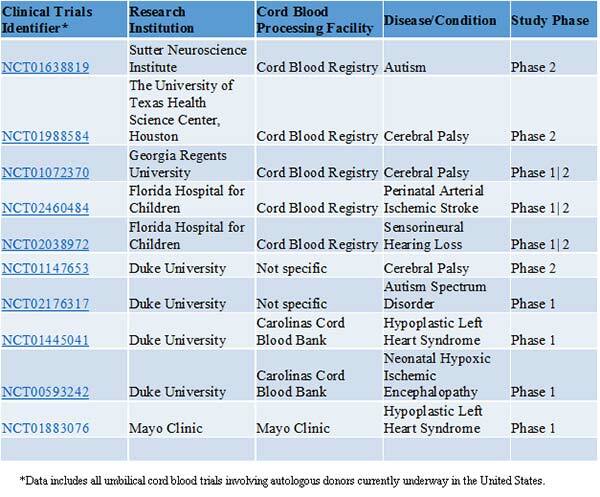 Conditions being explored in autologous cord blood trials in the U.S. include autism, cerebral palsy, ischemic/hypoxic brain injury, acquired hearing loss, and hypoplastic left heart syndrome (Table 1). Pending evidence of efficacy and a favorable safety profile, nearly all of the trials listed in Table 1 are amenable to expansion into trials using cord blood from HLA-matched siblings, and potentially, unrelated donors. If unrelated allogeneic cord blood based interventions are both safe and effective, it would likely increase utilization of inventory from public banks, tapping into a large number of units that may be less likely to meet current cell dose thresholds for adults in transplant medicine. Private and public cord blood banks each have their unique benefits. Public banks have access to a large number of donors and can focus on increasing genetic diversity in their donated units. Private banks are in the position to access large amounts of genotypic and phenotypic data that can be correlated with family health histories as well as inform trial design. All of these strengths will be important for advancing clinical trials. New technologies are primed to extend the advantages of umbilical cord blood in research and clinical applications even further. For example, in vitro cell expansion will be an important tool for increasing utilization of cord blood in adult transplants. With scientists refining technologies for generating induced pluripotent stem cells (iPSCs) from hematopoietic stem cells, cord blood may become a platform for a renewable cell source for diverse regenerative medicine applications.3 Cord blood banks would be an ideal starting point for iPSC banks, since they already have the necessary infrastructure in place for tissue screening and storage.4 In the realm of personalized medicine, cord blood banks are positioned to develop both patient-specific and disease-specific iPSCs. Cord blood banks are therefore poised to have a vital impact on stem cell-based medicine. Integrating continuously updated personal health data with cord blood banking will help drive and inform clinical trial strategy, and allow for targeted patient recruitment. Ongoing FDA-regulated clinical trials are a testimony to the fact that cord blood is increasingly being used by the research community. Inclusion of family health data will attract more researchers, whose aims are to personalize medicine and deliver the precise therapeutic option to each patient. Mahendra S. Rao, M.D., Ph.D., is the scientific co-founder, chief strategy officer, and chairman of the board for Q Therapeutics. He also acts as chief clinical and regulatory advisor for Cord Blood Registry. Katherine S. Brown, Ph.D. (kbrown@cordblood.com), is a principal scientist with CBR.